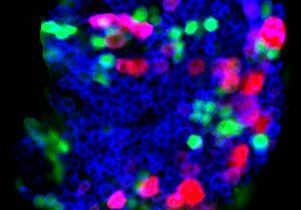 This discovery lays the groundwork for a better understanding of the role progenitor cells can play in immune system response and could lead to the development of more effective therapies for a wide range of diseases. The two-year study was published in the current issue of the journal Current Biology. Progenitor cells are the link between stem cells and fully differentiated cells of the blood system, tissues and organs. This maturation process, known as differentiation, is determined in part by the original environment that the progenitor cell came from, called the niche. Many of these progenitors are maintained in a quiescent state or “standby mode” and are ready to differentiate in response to immune challenges such as stress, infection or disease. Dr. Gabriel Ferguson, a postdoctoral fellow in Martinez-Agosto’s lab and first author of the study, built upon the lab’s previous research that utilized the blood system of the fruit fly species Drosophila to show that a specific set of signals must be received by progenitor cells to activate their differentiation into cells that can work to fight infection after injury. Ferguson focused on two genes previously identified in stem cells but not in the blood system, named Yorkie and Scalloped, and discovered that they are required in a newly characterized cell type called a lineage specifying cell. These cells then essentially work as a switch, sending the required signal to progenitor cells. The researchers further discovered that when the progenitor cells did not receive the required signal, the fly would not make the mature cells required to fight infection. This indicates that the ability of the blood system to fight outside infection and other pathogens is directly related to the signals sent by this new cell type. The researchers said that they hope future studies will examine these genes beyond Drosophila and extend to mammalian models, and that the system will be used by the research community to study the role of the genes Yorkie and Scalloped in different niche environments. Ferguson’s research on this project was supported by a Cellular and Molecular Biology National Institutes of Health predoctoral training grant. Additional funding was provided by the David Geffen School of Medicine at UCLA.